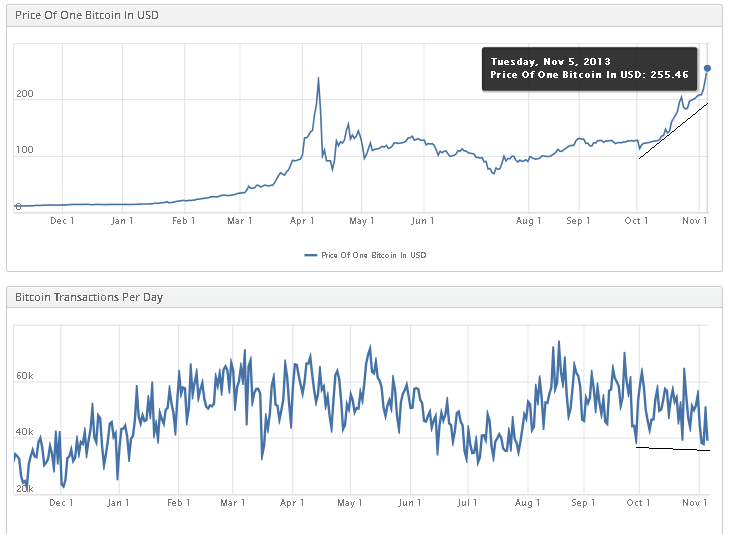 Bitcoin prices hit a new all-time high of $268.41 at the Mt. Gox exchange in early morning trading Wednesday, at 12:37 a.m. EST to be exact, according to the r/Bitcoin reddit forum. While prices for bitcoin have been on a tear the past month, having nearly doubled in value in just the few weeks, it’s at all clear that usage of bitcoin has been growing nearly as quickly. The transactions provided in the chart from Coinbase below show only 38,909 transactions for Nov. 5, which is actually a marginal decline from the 39,368 transactions at the end of September. This is surprising- a higher price might cause a lower amount of bitcoin to be transacted in a given day, but it’s not clear that it would cause a decline in the number of transactions overall. The long term case for rising bitcoin values presumably relies upon the growing usage of the currency, but these tepid transaction numbers certainly aren’t behind the increase in price over the past several weeks. On a side note regarding Coinbase, one concern which arose with several customers recently is the cancellation of orders due to a “High Risk” transaction. While it might make good business sense for the algorithm to cancel certain orders due to the potential for fraudulent transactions, i.e. insufficient bank funds, it’s unclear regardless why Coinbase couldn’t inform the customer immediately rather than at the end of the 4-day waiting period to receive bitcoin. According to blockchain.info, transactions have increased moderately in the past day to 53,297, but the trend has generally been in decline since August.